Located in Madrid, Spain, within the Golden Triangle of Art complex, the Prado Museum, also known as the Museo del Prado, is considered one of the greatest art museums anywhere in the world and offers extensive collections of fine European art dating back to the 12th century. The building that houses the Museo del Prado, which is one of the most-visited sites in the world and considered to be one of the greatest existing art museums, was designed in 1785 by Spanish architect Juan de Villanueva under orders by King Charles III to create a facility to house the country’s Natural History Cabinet. The museum is named for the prado, or meadow, that the building was constructed on, which also gives the Paseo del Prado boulevard its name. Construction on the building was halted during the Peninsular War and was not initiated again until the reign of King Ferdinand VII, though it was used as a cavalry headquarters during the war. At the suggestion of Queen María Isabel de Braganza, the facility was designated as the home of the National Museum of Painting and Sculpture, which officially opened to the public in November of 1819 as a facility meant to showcase works belonging to the Spanish Crown and raise Spain’s artistic reputation throughout Europe. In 1868, the museum was nationalized and renamed the Museo del Prado. At the museum’s opening, it housed more than 1,500 pieces previously held by the various Spanish royal residences. The royal collections, which had been historically held for centuries prior to the museum’s opening, were increased significantly throughout the 16th century by the Habsburg and Bourbon monarchs. Pieces from the Museo de la Trinidad were added to the museum in 1872, and collections from the Museo de Arte Moderno were incorporated in 1971. Throughout the 20th and early 21st centuries, the museum underwent a number of expansions, including the addition of rear pavilions, the incorporation of the Casón del Buen Retiro and Salón de Reinos buildings, and the addition of underground levels in 1998. In 2007, a major addition to the museum’s exposition room was completed, bringing its space up to 16,000 square meters. Planned major renovations will incorporate the Hall of Realms, a part of the former Buen Retiro palace, into a $32 million museum extension. Today, the Museo del Prado is one of the most-visited sites in the world and is considered to be among the world’s greatest art museums. The museum receives approximately 2.8 million visitors annually and is widely considered to house one of the greatest existing collections of European art, with collection items dating back to the 12th century. It is located within Madrid’s Golden Triangle of Art, which also contains the Museo Reina Sofía and the Thyssen-Bornemisza Museum. Other nearby art and cultural museums include the Real Academia de Bellas Artes and the Museo Arqueológico, which houses ancient Egyptian, Mesopotamian, Greek, and Roman works formerly owned by the Prado. More than 7,600 paintings and 8,200 drawings are held within the museum’s collections, along with 4,800 prints, 1,000 sculptures, and significant collections of other multidisciplinary works and historic documents. Approximately 1,300 works are displayed at the museum at any given time, with another 3,100 on loan to museums and institutions throughout the world. The museum is frequently described as a museum of painters rather than a museum of paintings, due to its staggered collecting process by numerous Spanish monarchs, which heavily represented certain artists according to personal taste. Francisco Goya is the museum’s most represented artist, along with significant holdings of works by El Greco, Peter Paul Rubens, Titian, Diego Velázquez, and Hieronymus Bosch. The best-known work displayed at the museum is Velázquez’s Las Meninas. Notable pieces from the Habsburg and Bourbon eras of the collection include The Family of Charles IV by Francisco Goya, Knight with his Hand on his Breast by El Greco, Charles V at Mülhberg by Titian, The Death of the Virgin by Mantegna, and La Perla by Raphael. Acquisitions since the museum’s opening include Rogier van der Weyden’s The Virgin and Child, along with a significant collection of medals donated to the museum by Pablo Bosch. The majority of the museum’s 19th-century collection comes from the Museo de Arte Moderno, including significant works by José de Madrazo y Agudo and Federico de Madrazo, Eduardo Rosales, Vicente López, and Carlos de Haes. Pieces acquired from the Museo de la Trinidad include five canvases by El Greco executed for the Colegio de doña María de Aragón. Other notable recent acquisitions include Goya’s Countess of Chinchón, Velázquez's The Pope's Barber, and Fra Angelico's Madonna of the Pomegranate. In addition to permanent collections, a variety of special exhibitions are housed at the museum on a rotating basis, featuring historic and contemporary artists from throughout Spain and Europe. 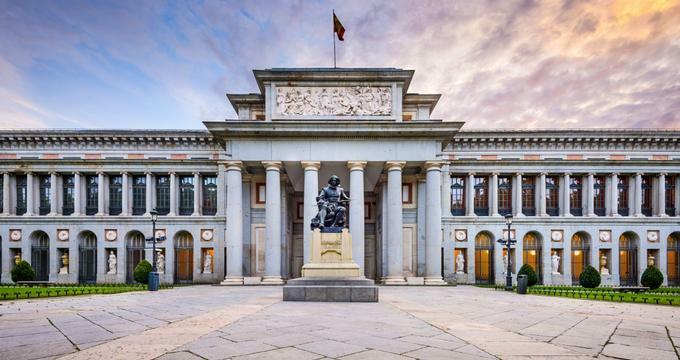 The Museo Nacional del Prado Library is one of the most important art libraries in the country, housing more than 75,000 volumes and 1,500 periodicals as well as significant holdings of audiovisual resources. More than 4,500 boxes of historical documents are also contained within the Museo Nacional del Prado Archive.